(WSJ) – In spite of Arcade Fire’s well-deserved Grammy Award for Album of the Year for its dystopic version of life in the suburbs in its album of that name, the long tug of war between big cities and suburbs is tilting ever so slightly back to the land of lawns and malls. 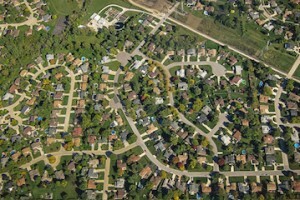 After two years of solid urban growth, more Americans are moving again to suburbs and beyond. ← A Melting Pot or a Pot o’ Bleach?